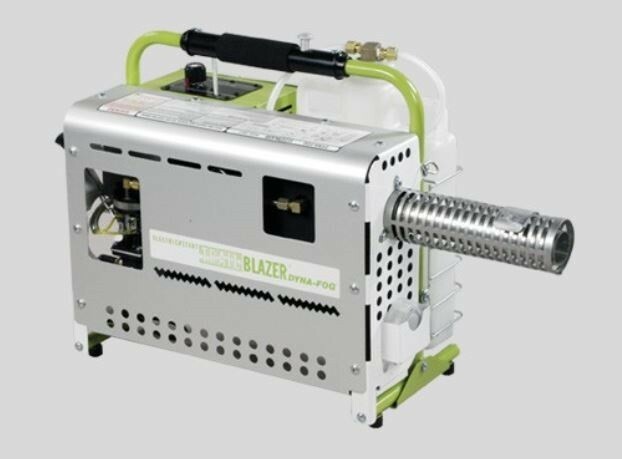 PRODUCT DESCRIPTION: This is a gas powered thermal or "hot" fogger which means it will heat oil or water based fogging solutions enough to convert them into a fog. This fog is then distributed over the landscape or in warehouses intending to control a range of insects. This mist is light – almost smoke like – and will stay suspended longer than cold space sprays. Since particle size is small, the fog can cover large areas better due to deep penetration and longer hang time. This unit is electric start (requires no pumping; completely automatic), gasoline powered and fairly easy to maneuver. WHERE TO USE IT: Outside around the home, farm, picnic grounds, camp areas, dumps, tire recyclers, gardens or just about anywhere noseeums are active and the need for a large fogging machine is required. Can also be used inside warehouses, commercial food processing plants, stables and more. RATE OF APPLICATION: This will vary depending on what you're fogging, where you're fogging, etc. In general, give us a call for consultation when treating warehouses or other commercial locations. For land owners, thermal foggers can handle several acres efficiently but again, give us a call so we can best outfit you based on your target insect, the area you want to treat, etc. Keep in mind the rate of flow for this machine is up to 5 gallons per hour when fogging with DEODORIZED OIL as the carrier. When using water, you will have a maximum output of just 2.5 gallons per hour since water based formulations take a lot more time and power to convert over to ULV. TECHNICAL SPECS: The droplet size in the fog will range from .5-50 microns. The flow rate takes about 12 minutes per gallon when using oil as the carrier but 25 minutes per gallon when using water as the carrier. The Trailblazer features a .85 gallon fuel tank and can hold 1 mixed gallon of solution. This unit features electric start powered by 8 "D" cell batteries. Compared to the Golden Eagle or Super Hawk, this unit is slightly heavier weighing in at 25 lbs when empty. Fuel and formulation mixtures can add 8-9 lbs per tank per gallon. This machine measures 31.5" long, 13" wide and 20.5 inches tall.